Nowhere else in the world will you find women with brass and gold alloy coils around their necks! * The Padaung or long-necked women, hail from Kayah state, in the southern part of the northeast region of Myanmar. Beginning from the tender age of five, when their bones are pliable and soft, the young girls wear the coils, with additional coils added every few years. The neck coils can weigh over 20 pounds, while the leg loops can weigh around 30 pounds. The coils near the neck are smaller and narrower before widening towards the shoulders. A cushion type of material protects the chin from the coils. Contrary to wide-held perceptions, the neck is not stretched. The weight of the brass coils push the collar bones down instead and compress the rib cage, and this results in a shorter rib region. The coils are usually changed when a longer coil is needed. The Padaung prefer to be referred to as Kayan and the name, ‘giraffe women’ is quite derogatory. I prefer to say, ‘swan-necked’ instead of ‘long-necked’ as they appear quite graceful when the coils are removed. By the time a Padaung woman reaches maturity, she can end up with a full set of 25 coils. Generally, their costume consists of a head scarf that winds gracefully around the head; a short, coat over a loose, embroider-edged, white tunic, a mini, dark blue skirt and dark leggings (perhaps they were the precursor of the western leggings). Having no historical records, theories abound as to the reasons behind the practice of coiling. They range from: protecting the neck from tiger bites; deterring slave traders from capturing the women, who may hopefully appear unattractive with their elongated necks; to preventing men from other tribes or regions from kidnapping the women. It was a wonderful experience, seeing these lovely, gentle women but the weight of the coils they wear, were astonishingly heavy. 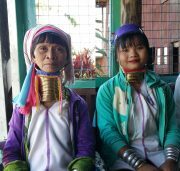 These unique and distinct brass coils identify these Kayan or Padaung women, their culture and their ethnicity. All photographs are my own except for two: the little Kayan girl and the young women with the coils removed. They are from the internet and my thanks go to the photographer. Footnote: *For those interested in facts, the Southern Ndebele women in South Africa wear rings as opposed to coils, around their neck and they do so after their marriage.